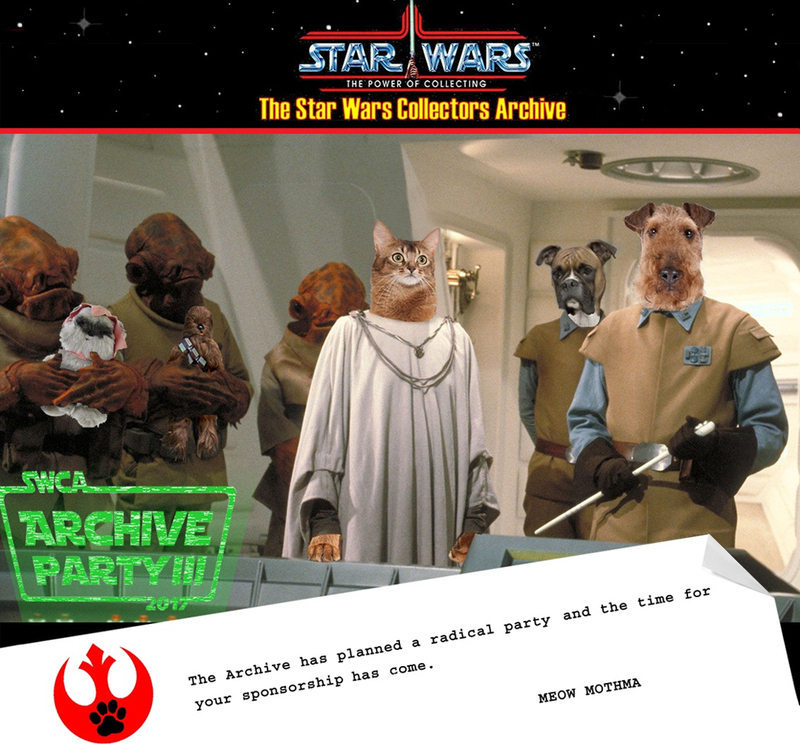 theswca blog: Join the Archive Party III Sponsorship Alliance! With the third chapter in the Archive Party Saga coming opening night of Celebration Orlando 2017 (Thursday April 13th at the Hyatt Regency), the time has come to recruit sponsors! This is the official call to the collecting community to be a major part of something fun that will support a very good cause. All proceeds beyond the cost of the event will be donated to the Pet Alliance of Greater Orlando, an organization which "educates, shelters, places, and heals pets and their families with compassionate, responsible care maintained to the highest professional standards." We had 25 sponsors for the first party, and 43 for the second. Not surprisingly, the cost of the event (in particular, the venue) continues to rise exponentially. In order to give more people the chance to be a part, and to help cover the higher expenses, we will be increasing the sponsorship roster to 48 (in honor of Skye’s favorite 48Bs). The first 48 sponsors that submit donations will secure their sponsorship and we want to have the deposit for the venue paid ASAP, so the sooner the better! Send an email to swca.party@gmail.com for additional details if interested. *Sponsors were allowed to split the cost of sponsorship for the first party. This option will be available again, with the understanding that joint-sponsorships will forgo their guest spots and determine among themselves how the exclusives will be distributed.